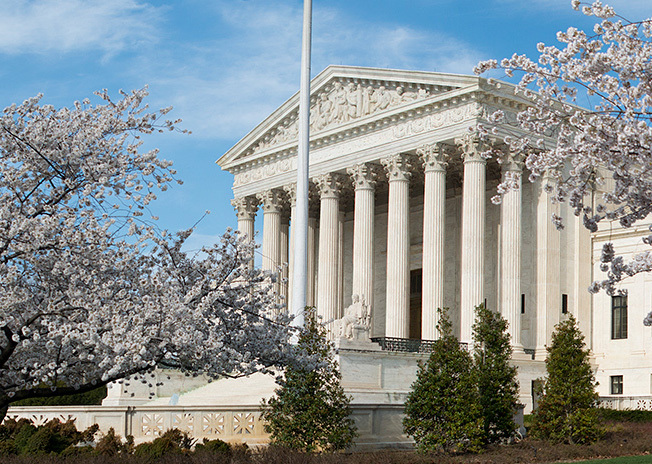 Three Amici Supporting Nautilus Productions Filed in Supreme Court! Nautilus Productions & Blackbeard on BBC – Radio Bristol! 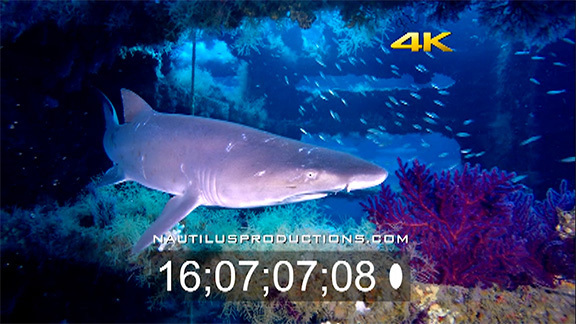 Nautilus Posts New 4K UHD Underwater Stock Footage! 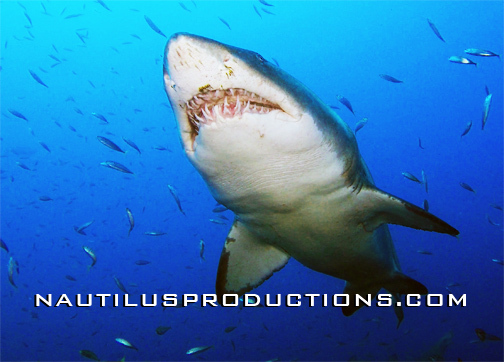 Nautilus Productions has uploaded over a dozen new 4K UHD underwater video clips for license. The new hours of stock footage include whale sharks, turtles, sea lions, octopus, angelfish, skates, lobster, lionfish and more. Locations include the Atlantic, Caribbean & Sea of Cortez. Watch the Clips! 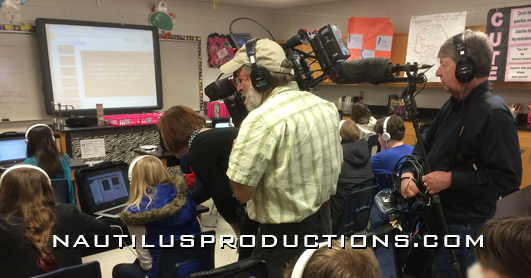 Nautilus Productions has added two new blogs to it’s media output. 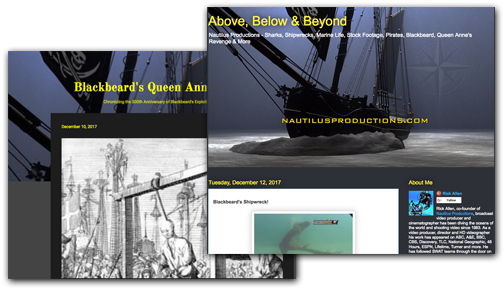 ‘Above, Below & Beyond‘ covers sharks, shipwrecks, marine life, stock footage, pirates, Blackbeard, Queen Anne’s Revenge, copyright & more. 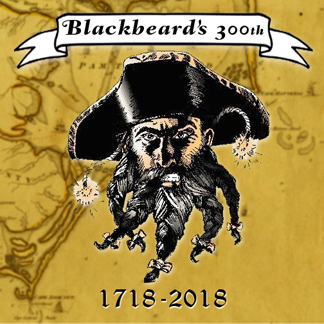 ‘Blackbeard’s Queen Anne’s Revenge‘ chronicles the 300th anniversary of the infamous pirate Blackbeard’s exploits in North Carolina. Check us out – more to come! These re-mastered project videos commemorate the publication of the Society for Historical Archaeology’s Journal, Historical Archaeology Mardi Gras Shipwreck Thematic Issue and the 10 year anniversary of the expedition. A mysterious sinking, a group of dedicated scientists and technicians and a 200 year old shipwreck have all collided in the Gulf of Mexico. Four thousand feet below the choppy seas the remains of a 19th century shipwreck lie in wait and a month long expedition was mounted to uncover her secrets. At the time, this was the deepest underwater archaeological project ever attempted in the Gulf of Mexico. Watch the videos here and order the full 52 min. DVD on AMAZON. 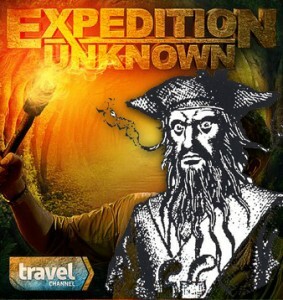 200,000 Views – For Our Blackbeard Project Video! 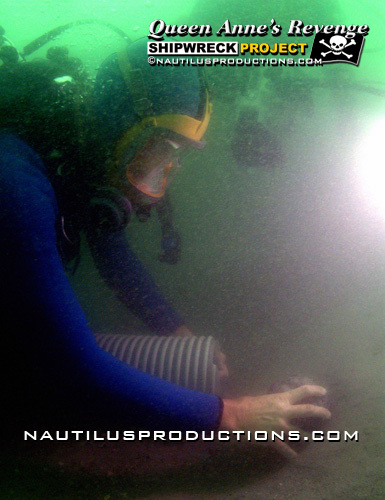 Blackbeard the pirate’s flagship, the Queen Anne’s Revenge, was discovered in 1996 by Intersal, Inc. Join Nautilus Productions LLC & underwater archaeologists from the Queen Anne’s Revenge – Blackbeard Shipwreck Project as they explore the 300 year old wreck site near Beaufort Inlet, NC. Watch the video. Pirates not welcome here! 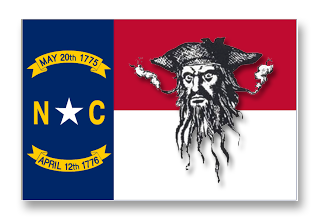 That was the message U.S. District Judge Terrence W. Boyle delivered Thursday, March 23, 2017 to the North Carolina Department of Natural and Cultural Resources (NCDNCR), its employees and the Friends of Queen Anne’s Revenge in response to their motion to dismiss a Federal lawsuit brought by Nautilus Productions. 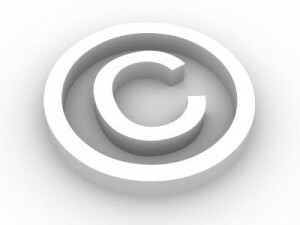 Judge Boyle’s decision allows the lawsuit for copyright infringement and for a declaration of the statute’s invalidity to move forward in Federal court. Sand Tiger Shark Page Updated! 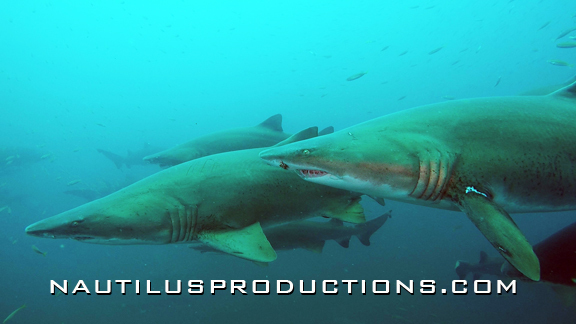 Nautilus Productions LLC has updated our “retro” Sand Tiger Shark Home Page with current links and information. The site includes shark characteristics, facts, federal protections, links and more. 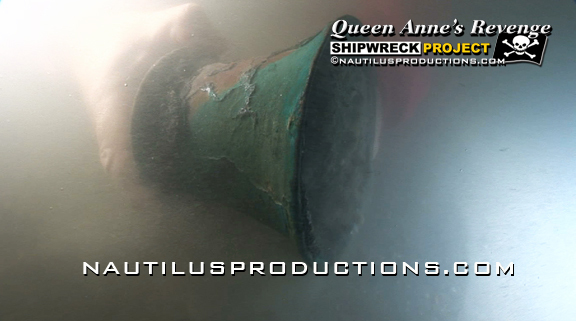 Nautilus Productions LLC has added stock footage video clips from the Blackbeard’s Queen Anne’s Revenge Shipwreck Project to our YouTube channel. 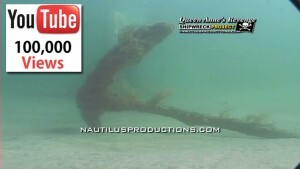 Blackbeard’s Queen Anne’s Revenge stock footage playlist. 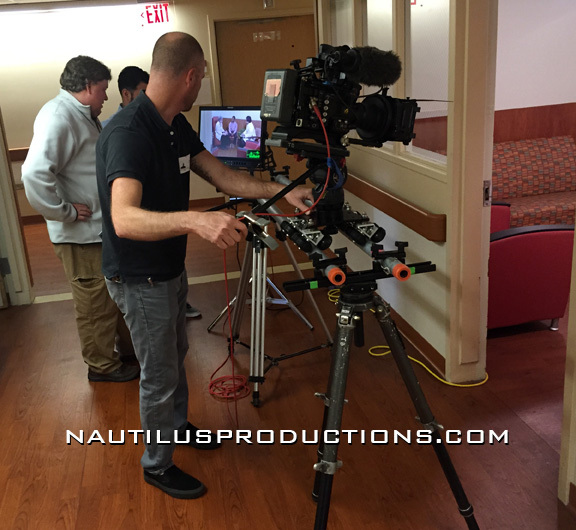 The Nautilus Productions LLC crew fine tuning a dolly shot during field production for our next video for Cape Fear Valley Health System. This is another in our series of in house and patient education videos. 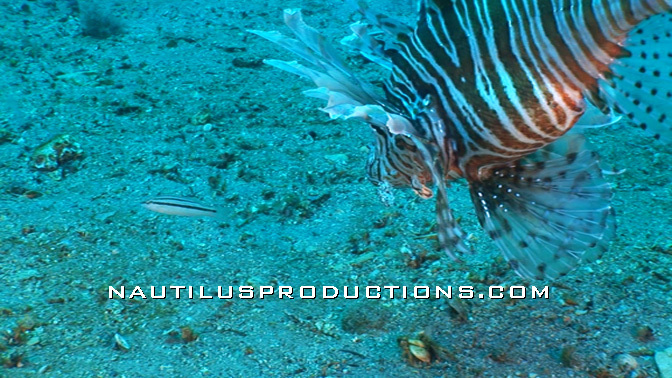 New Nautilus 4K Stock Footage! Nautilus Productions LLC has added new sample 4K UHD video clips of North Carolina Sand Tiger sharks, frogfish, remora, lionfish and marine life to our YouTube channel. 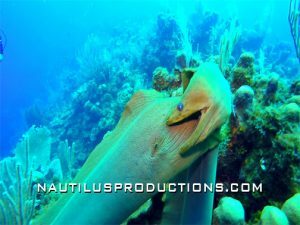 Nautilus Productions LLC has added new sample HD clips from our stock footage marine life collection to our Nautilus YouTube channel. Check out these green moray eels fighting and this sea turtle going about his underwater day or the sample underwater stock footage and video playlist. Nautilus Productions Adds Drone Capability! Through a partnership with Elite AUS, Nautilus Productions has added FAA licensed drone capabilities. Our professionally licensed and insured crew can safely handle your drone video production needs. The state isn’t talking about these lawsuits publicly. But since Allen filed his suit, a nonprofit set up to raise funds for the state’s QAR project, Friends of the Queen Anne’s Revenge, which is also named in the lawsuits, filed for dissolution in March. Allen filed an amended complaint in March, adding some 80 additional alleged violations of copyright infringement. Working with Ulf Marquardt of Marquardt Medienproduktion on a documentary about invasive species for WDR German Television. 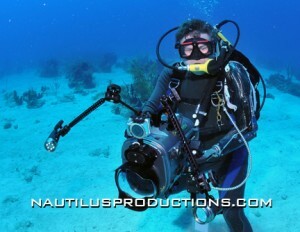 John Wisniewski provided pro lion fish wrangling services during set up for the blue screen shot. Nautilus Productions LLC. 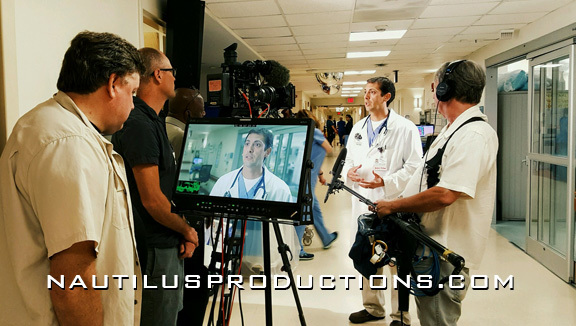 Nautilus Productions LLC has updated our Vimeo channel. 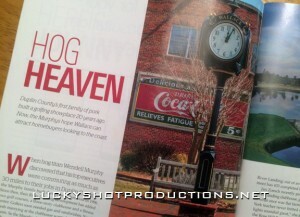 Lucky Shot Productions photographer extraordinaire, Cindy Burnham‘s work, is featured in the 35th Anniversary Edition of Business North Carolina magazine. The story, written by Allison Williams, focuses on the town of Wallace in Duplin county. 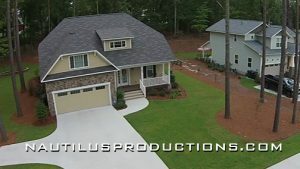 The Nautilus Productions crew just completed a cool time lapse video project for the great folks at Minc Interiors of Fayetteville, NC! 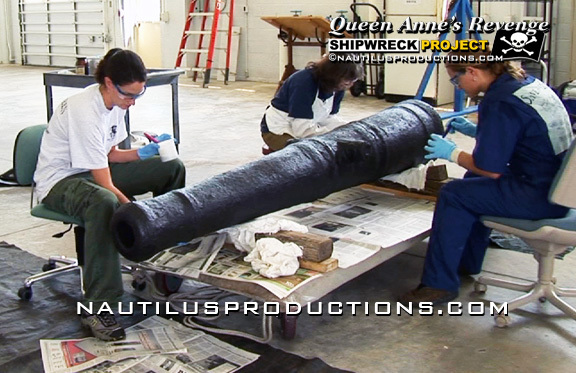 One of the Queen Anne’s Revenge – Blackbeard guns undergoing the last steps of conservation. It takes 3-5 years for one of Blackbeard’s cannon to go through electrolysis and conservation before it is ready for display. Blackbeard project videos from Nautilus Productions LLC. Artistry and archaeology meet as a conservator on the Queen Anne’s Revenge – Blackbeard Shipwreck Project painstakingly records the remains of one of Blackbeard’s bottles. 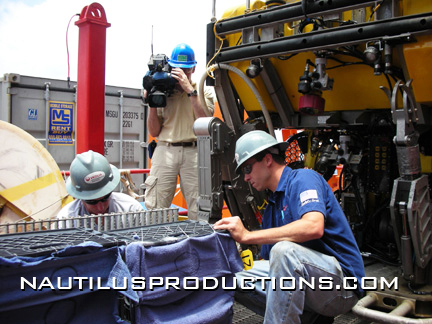 From the Nautilus Productions LLC stock video collection. “Rodin: Portraits of a Lifetime” opens Feb. 11, 2016 at Methodist University’s David McCune International Art Gallery. Nautilus Productions proudly produced the display video and commercial that accompanies the exhibit. 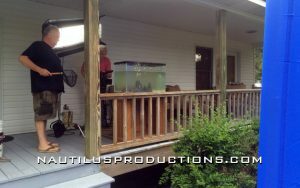 The Nautilus Productions LLC crew in South Carolina shooting several internal communications pieces for Office Depot. 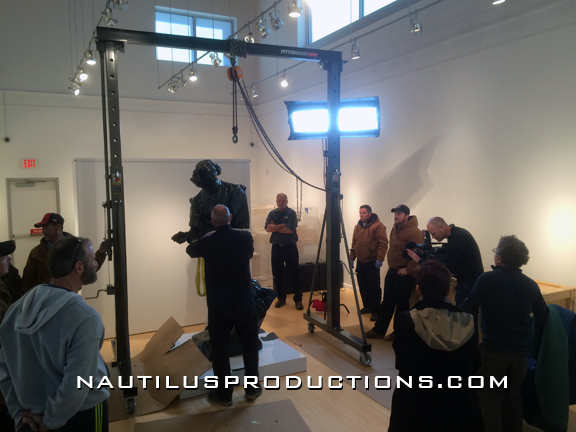 The Nautilus Productions LLC crew is busy documenting the installation of the exhibit “Rodin: Portraits of a Lifetime,” opening Feb. 11 at Methodist University’s David McCune International Art Gallery. 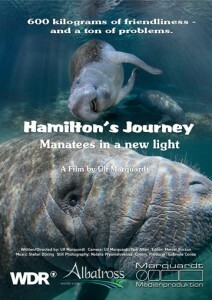 Nautilus Productions is proud to be producing videos to accompany the upcoming exhibit. “Rodin: Portraits of a Lifetime” will trace the artistic journey of Auguste Rodin. The exhibit of 17 sculptures and accompanying art valued at more than $2 million will be displayed through May 7 at Methodist’s David McCune International Art Gallery. 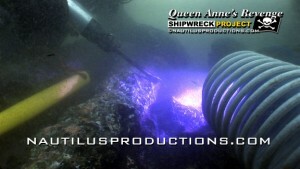 Nautilus Productions LLC has posted a new underwater video clip of cannon, anchors and the wreck site of the Queen Anne’s Revenge – Blackbeard shipwreck project. 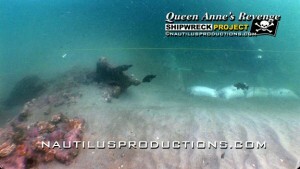 Click here for Blackbeard’s Queen Anne’s Revenge Shipwreck Project Gun & Anchor video. Nautilus Productions Celebrates 18 Years In Business! 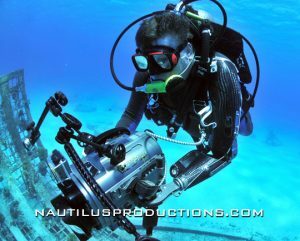 Over the past two decades the Nautilus crew has created programming for ABC, A&E, BBC, CBS, Discovery, ESPN, History Channel, National Geographic, 48 Hours, Lifetime, PBS, TLC, Turner and more. We’ve followed SWAT teams through the door on drug busts, traveled from Cuba to Kazakhstan with the 82nd Airborne, weathered live broadcasts during hurricanes, gone nose to nose with 14 foot Great White sharks, documented the recovery of Blackbeard’s flagship, the Queen Anne’s Revenge and the Mardi Gras Shipwreck 4000′ below the surface of the Gulf of Mexico and so much more. On December 1, 2015, the videographers who have spent almost two decades documenting the retrieval of Blackbeard’s pirate ship, the Queen Anne’s Revenge, filed a Federal lawsuit against Gov. Pat McCrory, the State of North Carolina, and others, in the U.S. District Court for the Eastern District of North Carolina. 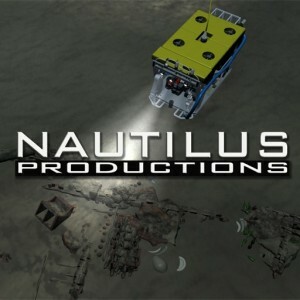 The lawsuit filed by Nautilus Productions LLC and its owner Rick Allen alleges that the recently passed “Blackbeard’s Law” is unconstitutional, and that the defendants have infringed copyrights owned and licensed by Allen and Nautilus, violated other federal laws, and engaged in unfair and deceptive trade practices. 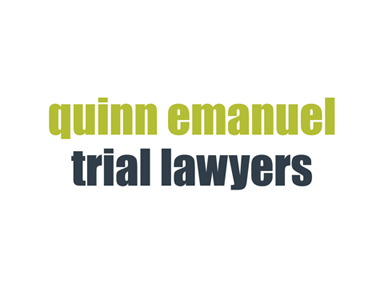 Defendants in addition to the Governor and the State include employees of the Department of Natural and Cultural Resources (NCDNCR), and the Friends of Queen Anne’s Revenge nonprofit. 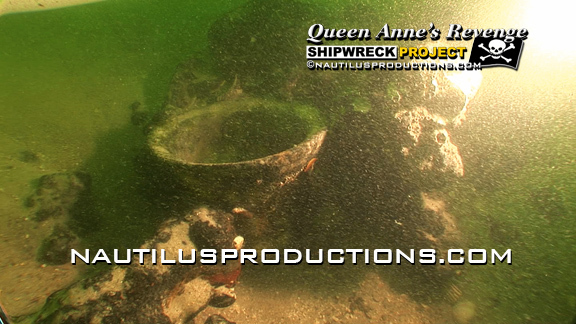 Nautilus Productions LLC provided underwater Queen Anne’s Revenge – Blackbeard stock footage for the Expedition Unknown series. The episode airs this month on the Travel Channel. Just another day at the office for the Nautilus Productions LLC crew. 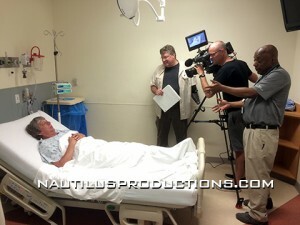 Working on another patient video for Cape Fear Valley Health System. A silver, cannon-handle of a basting spoon ready to surface from the Queen Anne’s Revenge – Blackbeard project. 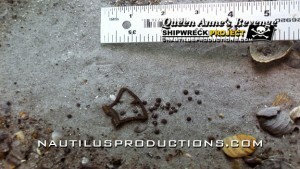 Video – Blackbeard’s Queen Anne’s Revenge Shipwreck Project Basting Spoon. From the Nautilus Productions LLC stock footage collection. 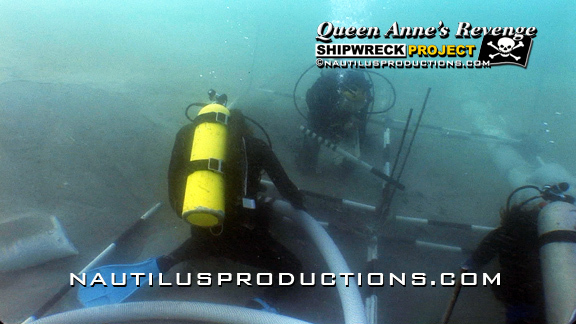 Every artifact gets mapped and tagged before heading to the surface for conservation on the Queen Anne’s Revenge – Blackbeard Shipwreck Project. 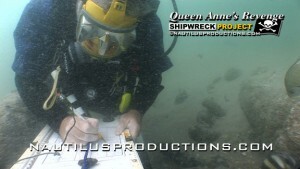 Video – Queen Anne’s Revenge Blackbeard Mapping. From the Nautilus Productions LLC stock footage collection. 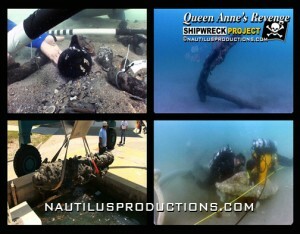 A divers eye view of the R/V Shell Point and the archaeology crew of the Queen Anne’s Revenge – Blackbeard’s Project. 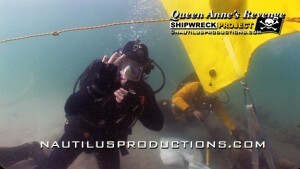 Video – Blackbeard’s Queen Anne’s Revenge Shipwreck Project Video. From the Nautilus Productions LLC stock footage collection. Reporter Michael Futch and photographer Cindy Burnham joined Nautilus Productions LLC to document scuba divers who intentionally seek out sharks. Here’s the video; Sand Tigers – On Assignment. And check out the story in Sunday’s Fayetteville Observer. These pewter plates and a pottery sherd concreted to a cannon belonged to the Queen Anne’s Revenge – Blackbeard crew. 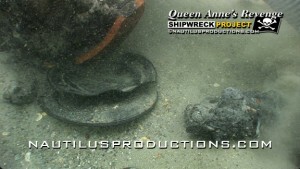 Video – Blackbeard’s Queen Anne’s Revenge Shipwreck Project Pewter Plates. From the Nautilus Productions LLC stock footage collection. On assignment with Cindy Burnham & Michael Futch of the The Fayetteville Observer & Rick Allen, collecting stock footage for Nautilus Productions LLC. 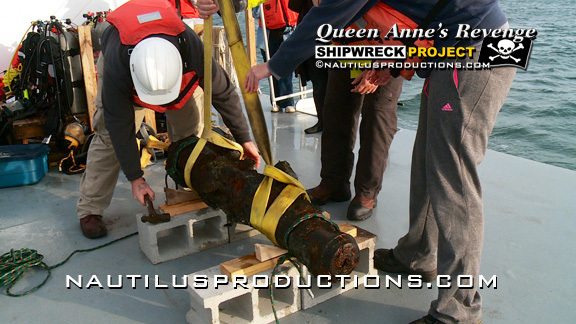 Sometimes a delicate archaeological instrument like a pneumatic chisel is the only way to free a stubborn cannon from the Queen Anne’s Revenge – Blackbeard Shipwreck Project. Video here – Blackbeard’s Queen Anne’s Revenge Cannon Deconcretion . From the Nautilus Productions LLC stock footage collection. Blackbeard Video Gets 100,000 Views! 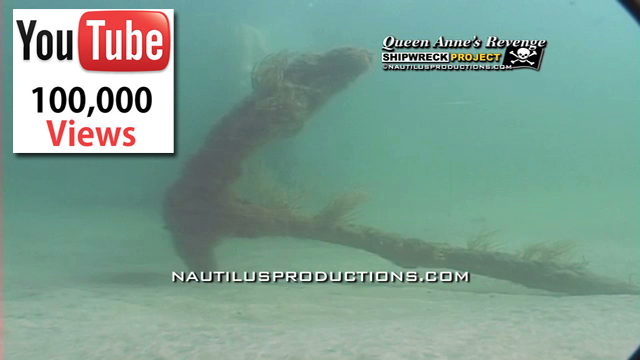 Nautilus Productions LLC video, Queen Anne’s Revenge Overview, has passed 100,000 views on our YouTube channel. Thank you! 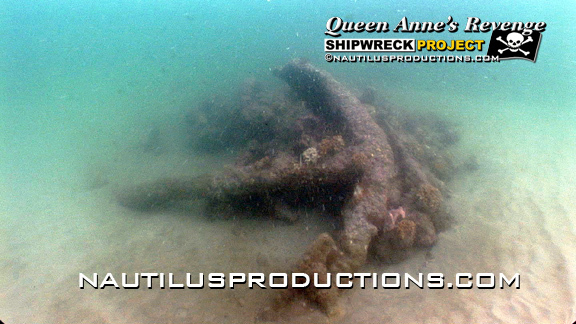 Nautilus Productions LLC is the exclusive licensor of stock footage & video from Blackbeard’s Queen Anne’s Revenge Shipwreck Project. For nearly two decades we’ve documented this amazing project. 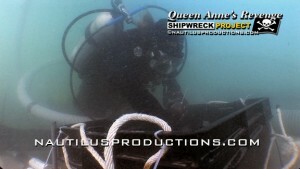 Some sample clips & video here – Queen Anne’s Revenge Blackbeard stock footage. For the full library and/or time code screeners contact us. The Nautilus Productions LLC crew spent the day in the Emergency Room at Cape Fear Valley Hospital creating a patient education video. Except for a much needed “Psych Eval” no crew members were harmed in the making of this video. 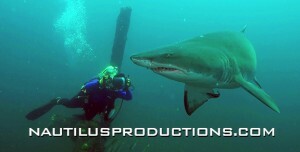 Nice link in the Fayetteville Observer to Nautilus Productions LLC Sand Tiger shark video! 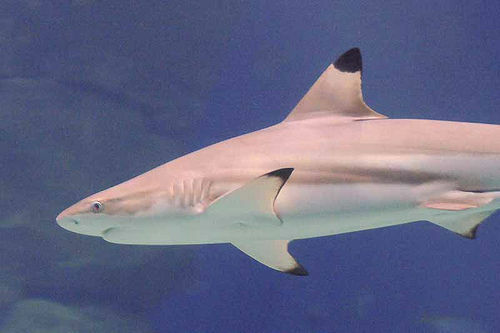 Eight people have been injured by sharks while swimming at North Carolina beaches in June & July. Here’s a map that shows the locations of the shark attacks. 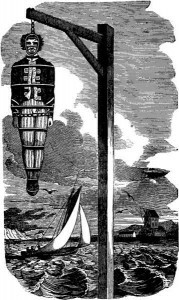 In the 1700’s sailors checked the depth of the water with a sounding weight attached to a knotted line. There are at least three of the cylindrical sounding weights in this image from the Queen Anne’s Revenge – Blackbeard Shipwreck Project. 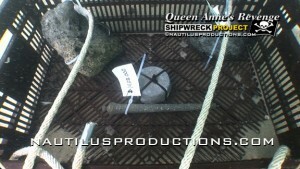 Video here – Queen Anne’s Revenge Shipwreck Project Sounding Weights. From the Nautilus Productions LLC stock footage collection. Blackbeard Runs the Queen Anne’s Revenge Aground! On this day, June 10th of 1718, Blackbeard the Pirate ran his flagship, the Queen Anne’s Revenge, aground near Beaufort Inlet, NC. This may be the first case of corporate downsizing in the new world. 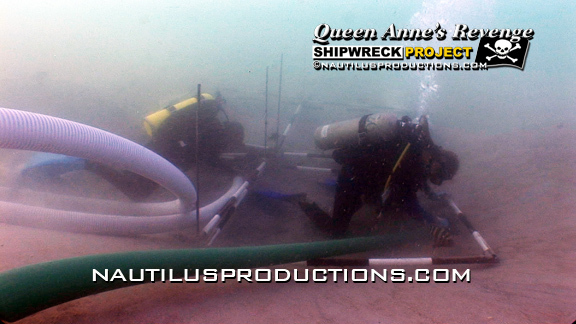 Watch Video – Blackbeard’s Queen Anne’s Revenge Shipwreck Project. 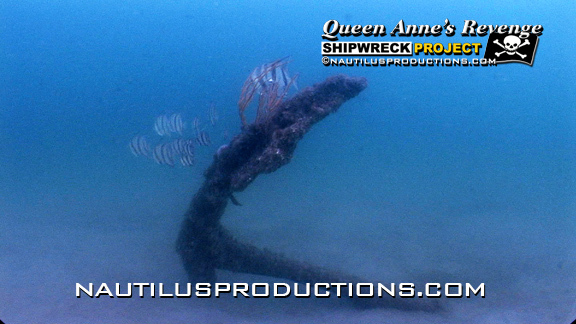 The Queen Anne’s Revenge grounded on a sandbar, cracking her main-mast and severely damaging many of her timbers. 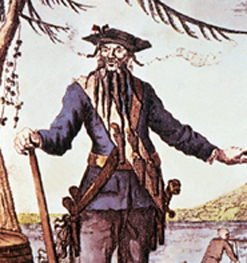 Blackbeard (aka Edward Teach) ordered his sloops to throw ropes across the flagship in an attempt to free her but the sloop Adventure also ran aground and both vessels appeared to be damaged beyond repair. Blackbeard then marooned half his crew and escaped to Ocracoke, NC. From the Nautilus Productions LLC stock video collection. 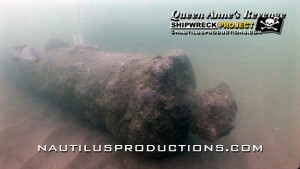 The 23rd of 31 cannon found on the Queen Anne’s Revenge – Blackbeard shipwreck site. The new cannon is approximately 56″ long, weighs over 300 lbs and may be a sister to a Swedish gun that was previously recovered. The 31 guns found so far are of Swedish, English and possibly French origins and of different sizes as would be expected with a pirate ship. 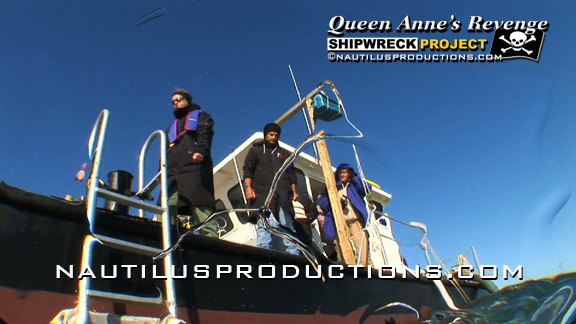 Video here – Blackbeard’s Queen Anne’s Revenge Fall 2014 Week 3. From the Nautilus Productions LLC stock footage collection. 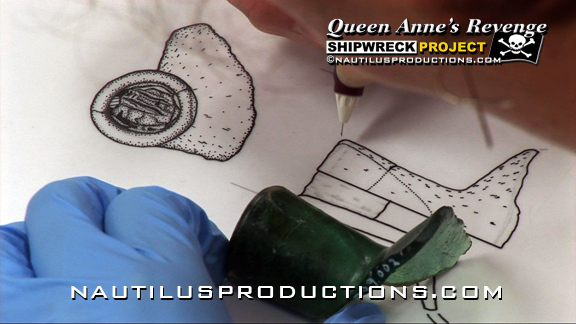 Video here – Blackbeard’s Queen Anne’s Revenge Shipwreck Project Onion Bottle. From the Nautilus Productions LLC stock footage collection. 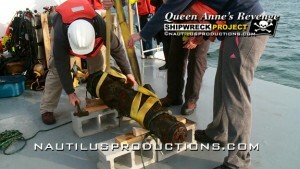 Archaeologist on the Queen Anne’s Revenge – Blackbeard Shipwreck Project gives the “OK” to begin raising one of Blackbeard’s cannon. The gun is 5′ long and the yellow lift bag is capable of raising an object weighing 1000 lbs. Video here – Blackbeard’s Queen Anne’s Revenge Fall 2014 Week 3. From the Nautilus Productions LLC stock footage library. In May of 1718 Blackbeard (aka Edward Teach) and his flotilla blockaded the port of Charleston (then known as Charles Town), South Carolina. All vessels entering or leaving the port were stopped. One ship he seized called the Crowley was headed for London with a group of prominent citizens on board including Samuel Wragg (a member of the Council of the Province of Carolina). Teach informed Wragg and the prisoners that his fleet required medical supplies from the colonial government of South Carolina, and that if none were forthcoming, all prisoners would be executed, their heads sent to the Governor and all captured ships burnt. Video here – Blackbeard’s Queen Anne’s Revenge Shipwreck Project Video. From the Nautilus Productions LLC stock footage collection. One of our favorite videos as archaeologists dredge & recover artifacts from the Queen Anne’s Revenge – Blackbeard shipwreck site. Video here – Blackbeard’s Queen Anne’s Revenge Wreck Site & Flyover. The large anchor and most of the ballast pile have been removed since this video was shot in 2008. From the Nautilus Productions LLC stock footage collection. 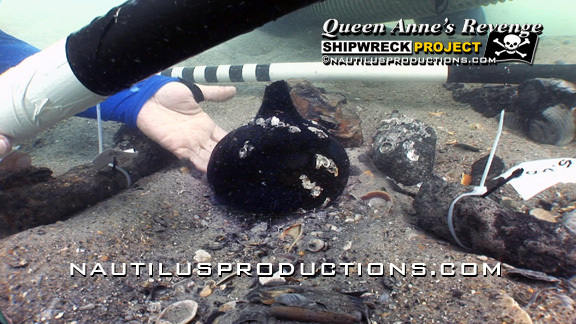 Each object or concretion recovered from the Queen Anne’s Revenge – Blackbeard shipwreck site offers another clue to the story of the infamous pirate. 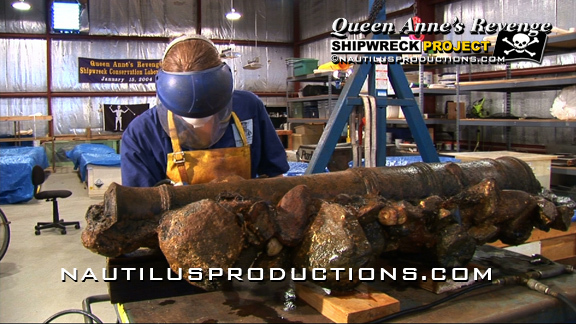 Video here – Queen Anne’s Revenge Artifact Lift Video. From the Nautilus Productions LLC stock footage collection. A pirate buckle, most likely from Blackbeard’s crew, recovered from the Queen Anne’s Revenge – Blackbeard wreck site. Video here – Blackbeard’s Buckle & Dividers. From the Nautilus Productions LLC stock footage collection. 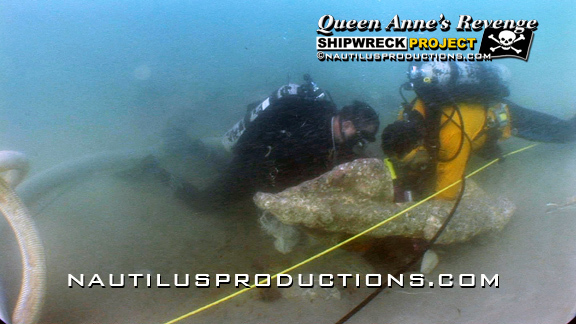 The view of anchor A2 on the Queen Anne’s Revenge – Blackbeard shipwreck site as archaeologist work to free a 5′ long cannon hidden behind the fluke. 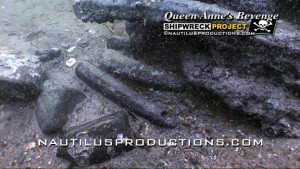 Video here – Blackbeard’s Queen Anne’s Revenge Cannon Deconcretion. From the Nautilus Productions LLC stock footage collection. The noise on the video is the pneumatic chisel in use. Before any artifacts can be recovered from the Queen Anne’s Revenge – Blackbeard shipwreck archaeologists need to dig some holes. Video – Dredging on Queen Anne’s Revenge. A diesel powered pump drives an induction dredge that acts as a giant underwater vacuum cleaner for excavating the site. From the Nautilus Productions LLC stock footage collection. Nautilus Productions LLC had the great honor & pleasure of shooting part of this film for Marquardt Medienproduktion! 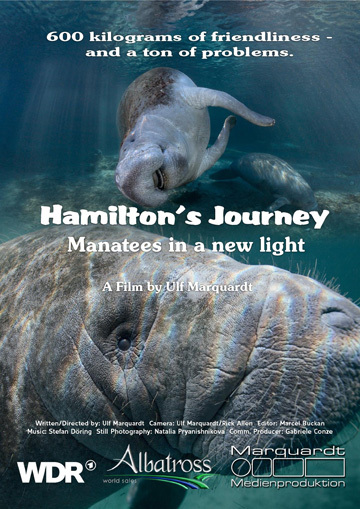 So far the film has won the Best Film Story Award at the ‘Water, Sea & the Oceans‘ International Film Festival 2014, First Place, category “Professional,” at the PAF Tachov International Diver’s Festival in the Czek Republic and “Special Prize” & “Highly Commended” diploma at “Matsalu Nature Film Festival” in Estonia! Footage of the main pile with the massive anchor A1 and ballast stones from the Queen Anne’s Revenge – Blackbeard Shipwreck Project. 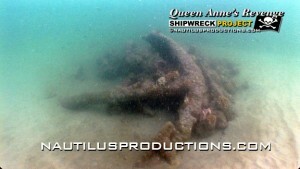 Video – Blackbeard’s Ballast Pile & Anchor. The anchor has since been removed and the pile has been deconstructed and no longer exists in this form. From the Nautilus Productions LLC stock footage collection. If you we’re a member of the Queen Anne’s Revenge – Blackbeard crew there wasn’t a bottle of aspirin waiting on the shelf. Instead the ships surgeon would whip up your medicine in an apothecary mortar. Here’s the video from 2006 when the mortar was found – Blackbeard’s Apothecary Mortar. The pestle was recovered in 2008. In June of 1718 Blackbeard the Pirate ran his flagship, the Queen Anne’s Revenge, aground near Beaufort Inlet, NC in what may be the first case of corporate downsizing in the new world. The Queen Anne’s Revenge grounded on a sandbar, cracking her main-mast and severely damaging many of her timbers. Blackbeard ordered his sloops to throw ropes across the flagship in an attempt to free her but the sloop Adventure also ran aground and both vessels appeared to be damaged beyond repair. 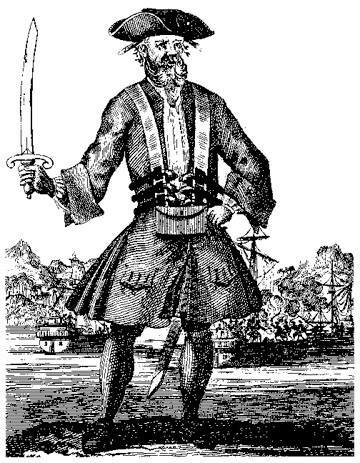 On this day of March 12, 1719 fourteen of Queen Anne’s Revenge – Blackbeard crew members were executed. Two escaped the gallows. One proved that he had participated in the bloody fight with Virginia troops out of necessity and was only a guest at a drinking party on Teach’s ship and not a pirate. The other, Israel Hands, was not present at the fight. He claimed that during a drinking session Teach had shot him in the knee, and that he was still covered by the royal pardon. The remaining 14 pirates were hanged and left to rot in gibbets along Williamsburg’s Capitol Landing Road. Read More! “Secrets: Blackbeard’s Ship” will air March 13 & 14 on the Smithsonian Channel. Nautilus Productions LLC is proud to have provided stock footage from the Queen Anne’s Revenge – Blackbeard Shipwreck Project for the one hour documentary. 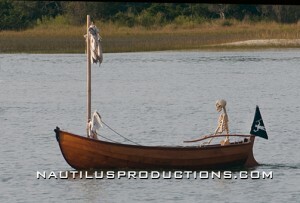 http://www.smithsonianchannel.com/…/3412161/blackbeards-ship.